The hype cycle is a branded graphical presentation developed and used by the American research, advisory and information technology firm Gartner to represent the maturity, adoption, and social application of specific technologies. The hype cycle provides a graphical and conceptual presentation of the maturity of emerging technologies through five phases. Each hype cycle drills down into the five key phases of a technology's life cycle. Technology Trigger A potential technology breakthrough kicks things off. Early proof-of-concept stories and media interest trigger significant publicity. Often no usable products exist and commercial viability is unproven. Peak of Inflated Expectations Early publicity produces a number of success stories—often accompanied by scores of failures. Some companies take action; most don't. Trough of Disillusionment Interest wanes as experiments and implementations fail to deliver. Producers of the technology shake out or fail. Investment continues only if the surviving providers improve their products to the satisfaction of early adopters. Slope of Enlightenment More instances of how the technology can benefit the enterprise start to crystallize and become more widely understood. Second- and third-generation products appear from technology providers. More enterprises fund pilots; conservative companies remain cautious. Plateau of Productivity Mainstream adoption starts to take off. Criteria for assessing provider viability are more clearly defined. The technology's broad market applicability and relevance are clearly paying off. If the technology has more than a niche market then it will continue to grow. 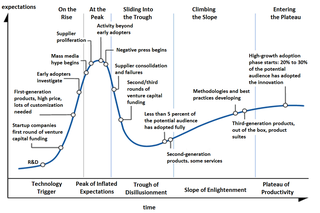 The term "hype cycle" and each of the associated phases are now used more broadly in the marketing of new technologies. Hype (in the more general media sense of the term "hype") plays a large part in the adoption of new media. Analyses of the Internet in the 1990s featured large amounts of hype, and that created "debunking" responses. A longer-term historical perspective on such cycles can be found in the research of the economist Carlota Perez. Desmond Roger Laurence, in the field of clinical pharmacology, described a similar process in drug development in the seventies. The cycle is not scientific in nature, and there is no data or analysis that would justify the cycle. With the (subjective) terms disillusionment, enlightenment and expectations it can not be described objectively or clearly where technology now really is. The terms are misleading in the sense that one gets the wrong idea what he or she can use a technology for. The user does not want to be disappointed, so should he or she stay away from technology in the Trough of Disillusionment? No action perspective is offered to move technology to a next phase. This appears to be a very simplified impulse response of an elastic system representable by a differential equation. Perhaps more telling would be to formulate a system model with solutions conforming to observable behavior. An analysis of Gartner Hype Cycles since 2000 shows that few technologies actually travel through an identifiable hype cycle, and that in practice most of the important technologies adopted since 2000 were not identified early in their adoption cycles. AI winter, in referring to periods of disillusionment with artificial intelligence. ^ "Amara's Law". Archived from the original on April 10, 2018. Retrieved April 26, 2017. ^ Santoso, Alex (September 5, 2012). "Four Geeky Laws That Rule Our World". Neatorama. Retrieved April 26, 2017. ^ "Encyclopedia: Definition of: Amara's law". PC Magazine. Retrieved 18 February 2015. ^ "isen.com: Amara's Law -- SMART Letter #63". Retrieved 26 April 2017. ^ 1963-, Chaffey, Dave (2016). Digital marketing. Ellis-Chadwick, Fiona (Sixth ed.). Harlow: Pearson. pp. 140–141. ISBN 9781292077611. OCLC 942844494. ^ a b Flew, Terry (2008). New Media: An Introduction (3rd ed.). South Melbourne: OUP Australia and New Zealand. ISBN 978-0-19-555149-5. ^ Negroponte, Nicolas (1996-01-03). Being Digital (1st ed.). Vintage. ISBN 978-0-679-76290-4. ^ Kelly, Kevin (1997-09-01). "New Rules For The New Economy". Wired. 5.09. Retrieved 2011-12-30. ^ Dyson, Esther (1997). Release 2.0: A Design For Living In The Digital Age (1st ed.). New York: Broadway Books. ^ Henton, Doug; Held, Kim (2013). "The dynamics of Silicon Valley: Creative destruction and the evolution of the innovation habitat". Social Science Information. 52 (4): 539–557. doi:10.1177/0539018413497542. ISSN 0539-0184. Veryard, Richard (September 16, 2005). "Technology Hype Curve". Retrieved March 10, 2016. ^ Weinberg, Gerald; et al. (September 5, 2003). HypeCycle. AYE Conference. Retrieved March 10, 2016. ^ Aranda, Jorge (October 22, 2006). "Cheap shots at the Gartner Hype Curve". Retrieved March 10, 2016. ^ a b "8 Lessons from 20 Years of Hype Cycles". LinkedIn Pulse. 2016-12-07. Retrieved 2017-01-04. ^ "RootBranded | Mindshift Magazine". RootBranded | Saving Great Ideas from Obscurity. Retrieved 2018-09-15. Jackie Fenn & Mark Raskino (2008). Mastering the Hype Cycle: How to Choose the Right Innovation at the Right Time. Harvard Business Press. ISBN 978-1-4221-2110-8. 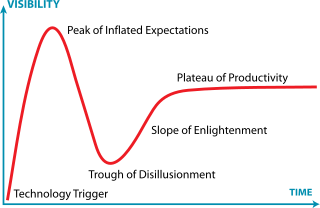 Wikimedia Commons has media related to Hype cycle. Hype Cycle Research Methodology, the official materials.